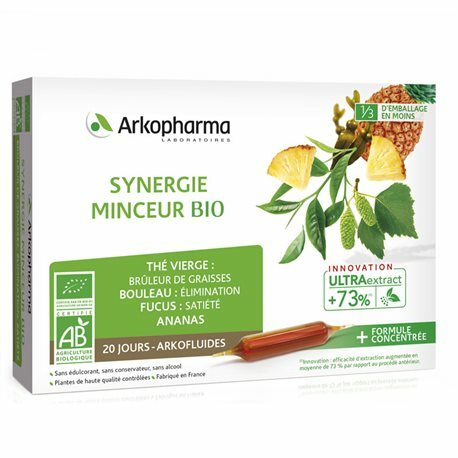 ARKOFLUIDE BIO SYNERGIE MINCEUR ampoules of ARKOPHARMA LABORATORIES are nutritional supplements that accompany your program to lose weight and find a harmonious silhouette. The ARKOPHARMA LABORATORIES wish to bring you the best of what nature offers us, that is why the ARKOFLUIDE range is the result of a long research and is the object of an ever greater innovation to offer you natural complements, who are safe allies and guarantors of good health and the maintenance of the functions of the organism in a natural way. Arkofluides Synergie Minceur Bio is a food supplement for people who want to find a harmonious silhouette. Green tea contains vitamins C, E, B and A, polyphenols, chlorophyll and theine, it stimulates psychic functions, which are put to the test during a diet and acts on the destruction of localized fat and decreases metabolism, its diuretic action promotes the elimination of waste and water retention phenomena through the kidneys. The fucus is an aquatic plant native to the marine environment and has the property of swelling in contact with water thanks to its mucilage that can give a feeling of satiety very useful during slimming cures. This plant helps drain the liver and kidneys, it fights obesity, increases the urinary volume and promotes the elimination of bile. It acts on the localized and painful oedemas to decongest the affected areas, it is anti-inflammatory and will alleviate the pains caused the accumulation of cellulite and water retention, it promotes the elimination by the urinary tract, detoxifies the skin. organism and lowers blood sugar. The ARKOFLUIDE BIO SYNERGIE SLIMMING ARKOPHARMA LABORATORIES ampoules, will act on all fronts to facilitate and promote your weight loss and help you achieve your goal. The greasy mass gradually decreases to give way to a graceful and elegant silhouette. 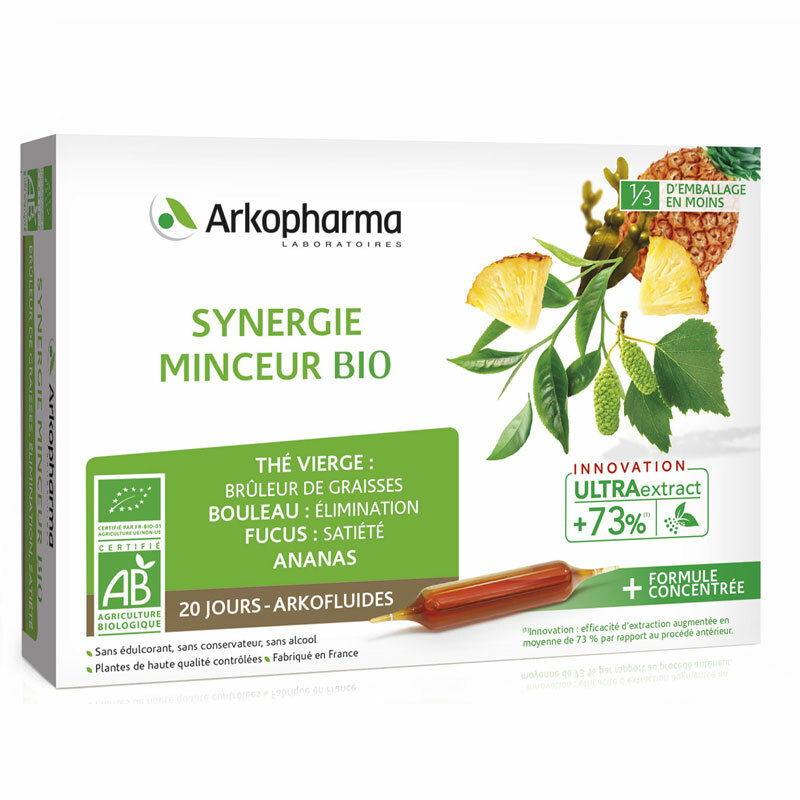 ARKOFLUIDE BIO SYNERGIE MINCEUR ampoules ARKOPHARMA LABORATORIES, are taken every day at a rate of one bulb daily. Shake the ampoule of medicinal plant extract before opening. Given the natural nature of the product, a slight deposit may appear but does not affect its quality. With your index finger, tap each end of the Arkofluide bulb to weaken them. Using a paper towel, break the first end out of the glass to avoid falling debris. Flip the Arkopharma ampoule and place the first end above the glass. Break the 2nd end out of the glass with a paper towel. Let the liquid flow. Add the equivalent of half a glass of water or fruit juice (125 ml). Virgin Tea (also called Green Tea), which is used only young leaves, is an unfermented tea to retain all its properties. This plant helps support the natural metabolism of fats. Fucus, known for its effect on satiety, helps to limit calorie intake. Pineapple is an exotic terrestrial species of herb whose fruit, edible, is particularly appreciated for its taste. Orthosiphon, used in Southeast Asia, helps eliminate water and toxins from the body. Are nutritional supplements that are part of a slimming program consisting of a varied, balanced diet associated with a healthy lifestyle. After several years of research with leading specialists in plant extraction, Arkopharma laboratories propose to reinvent liquid herbal medicine with the new ULTRAextract® extraction process for the Arkofluides® range. Combining innovation, performance and respect for nature, ULTRAextract® is based on a novel method of ultrasound-assisted plant extraction, which makes it possible to draw from the heart of the plant its active compounds, without the use of synthetic solvents. On average, the extraction efficiency of the active ingredients of medicinal plants is increased by 73% compared to the conventional process used previously. Aqueous extract of BIO plants [obtained from 926 mg of organic green tea leaf (Camellia sinensis), 741 mg of organic Birch leaf (Betula pendula, betula pubescens), 186 mg of Fucus BIO thallus (Fucus vesiculosus, Fucus serratus, Ascophyllum nodosum) used by ampoule] - Concentrated pineapple juice ORGANIC (Pineapple comosus).